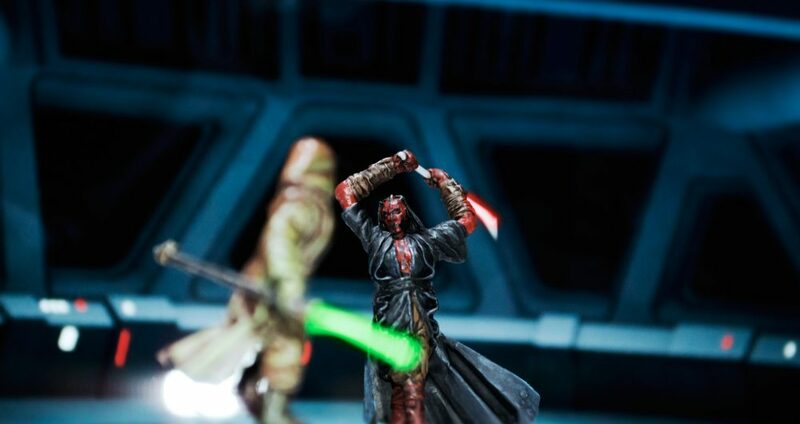 With all the Star Wars love going around at the moment my enthusiasm for making Star Wars miniatures is at an all time high. 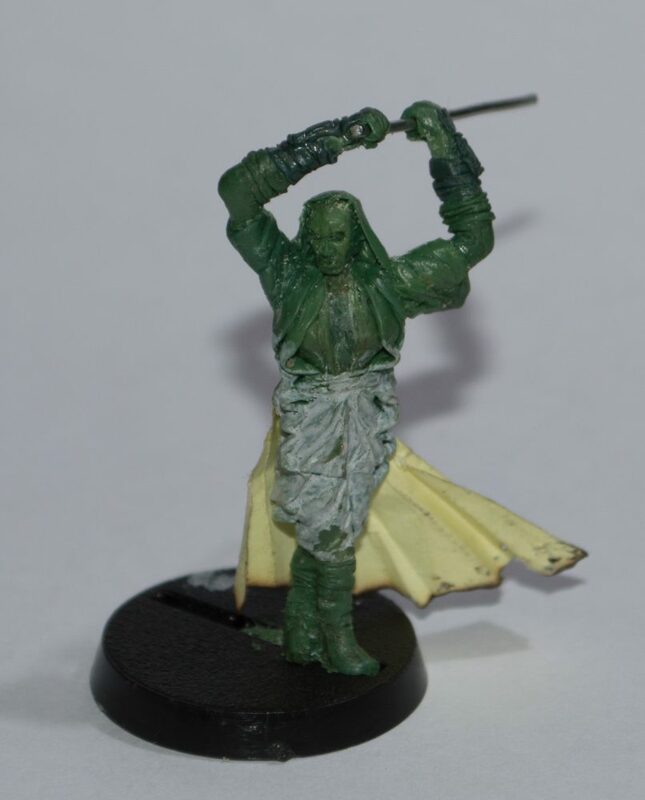 My latest Green Stuff project was a villain for my earlier 28mm Jedi Knight Green Stuff Sculpture. With Star Wars episode VII teaser trailer #2, Fantasy Flight Games (FFG) Star Wars Armada and Star Wars Battlefront III all getting some love this week and getting the chance to dress up as a Jedi to raise money for red nose day a few weeks ago it’s hard for my enthusiasm for Star Wars to be any higher. It’s only natural this would inspire my creativity, the result is another Star Wars 28mm Green Stuff sculpture a Sith Lady (Lord?) 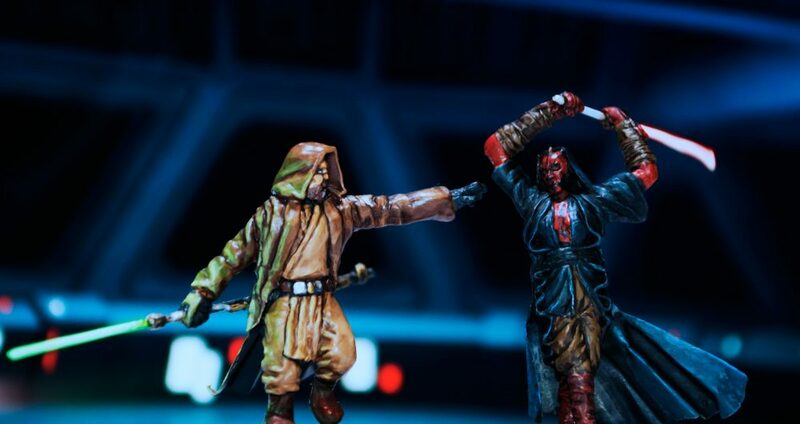 based loosely on Darth Maul. I originally intended her to be a larger counterpart of the 15mm Twi’lek I created several months ago. However the Red Nose Day fundraiser at work had me and a friend dressing up as Star Wars characters. 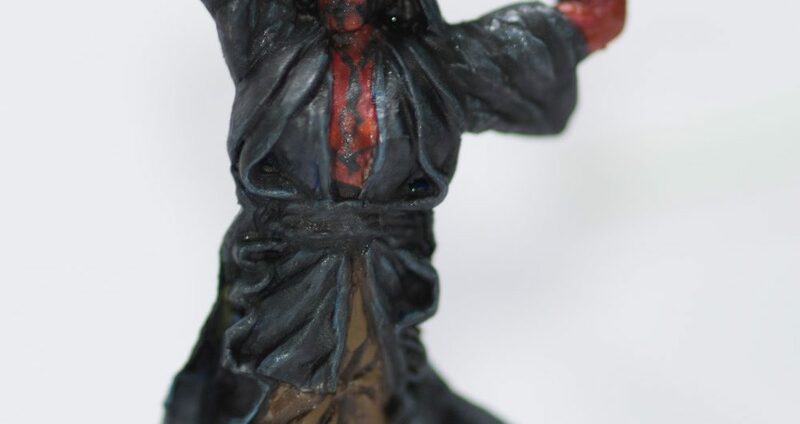 My friend transformed herself into Darth Maul and was absolutely terrifying to look at, which drove me to adjust the Sith miniature to be a Zabrak, the species made famous by the Dual Lightsaber wielding Darth Maul in Star Wars Episode I and the inspiration for her costume. 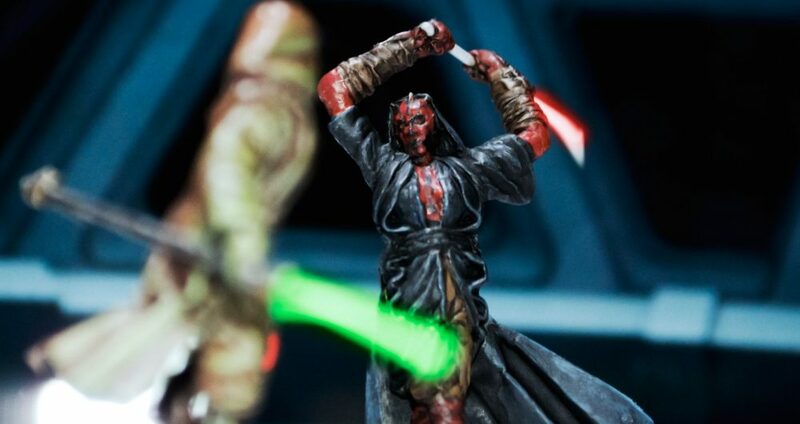 Darth Maul is one of the more memorable villains from the prequel trilogy and one of the few redeeming points from Episode I. 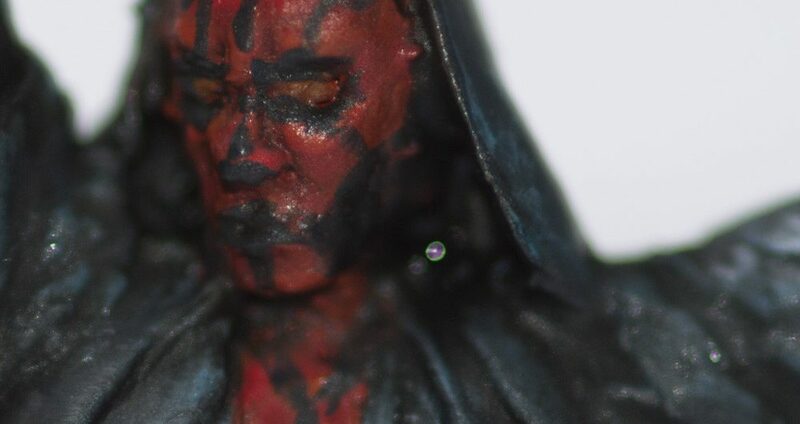 His black and red “tattoos” horned forehead and menacing look make him visually stunning and perfect for a tabletop or display case and a clear “bad guy” counterpart to my more traditional jedi characters. I have covered these steps in more detail in my previous 28mm Star Wars Miniature and Green Stuff tutorial before. I started with the basic pose blocked out in Green Stuff. The basic shape is defined with sausages and blobs to give the later layers something to stick to. I make it thinner then the final sculpt will end up being, making a mental note of areas that might be covered up to help hide any crimes. I wanted the pose to look elegant and graceful like a dancer or balerina more then a fighters more traditional stance so I opted to make her narrow, have her feet crossed as if she was in a spin and her arms up high to still have that deadly blade raised high ready to strike. The next step is to define muscle areas and flesh. Building the model up with human proportions, even defining areas like the arms legs and breasts even though they will be covered later, having something solid to sculpt cloth and clothes over, will help to define the folds in the fabric. The head and face is blocked out with eye sockets and the general cheek structure. The basic shape and base pose of the character. From here you can begin to add the clothes, I wanted to stick with the traditional Jedi/Sith clothing of loose baggy clothing thats easy to move in but add a little bit of seductiveness to the model without showing too much skin, after all what sort of Sith Lady wouldn’t use her feminine wiles to turn her weak minded male counterparts to the Dark Side? I added each item of clothing in layers, allowing each layer to dry before starting the next, this allows the fabric to flow and take on a natural shape adding a little bit of style or flare in place of physics to make some areas more interesting. 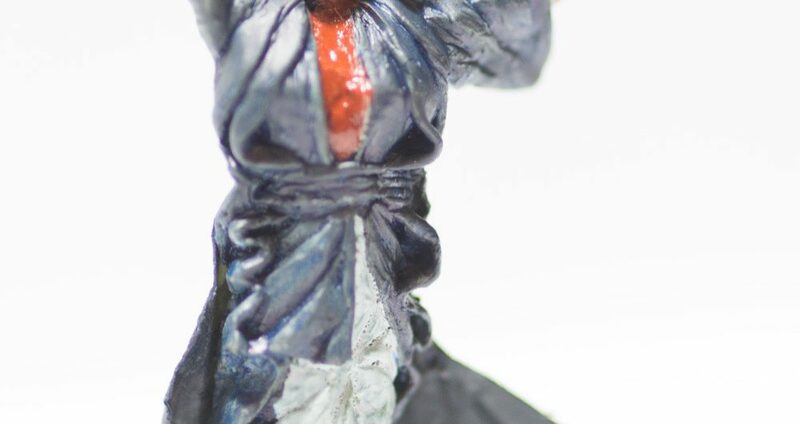 The hood was a single sheet of green stuff rolled out flat on a sheet of non stick wax paper, allowed to semi dry so that its tacky then stretched it over the head of the model so it would naturally take on the form i then folded it under itself and blended it with the rest of the robe. The flowing area of the robe is a small bit of paper folded and cut to look like its flowing in the wind or from motion, varnished and painted its relatively tough and should resist a bit of abuse. Its about now I take a file and sharp knife to the mini and clean up and rough edges preparing the model for fine details. This is the final step in the sculpt, your fine details, depending on the style of your mini or your own skill you can add as much or as little detail as you want. 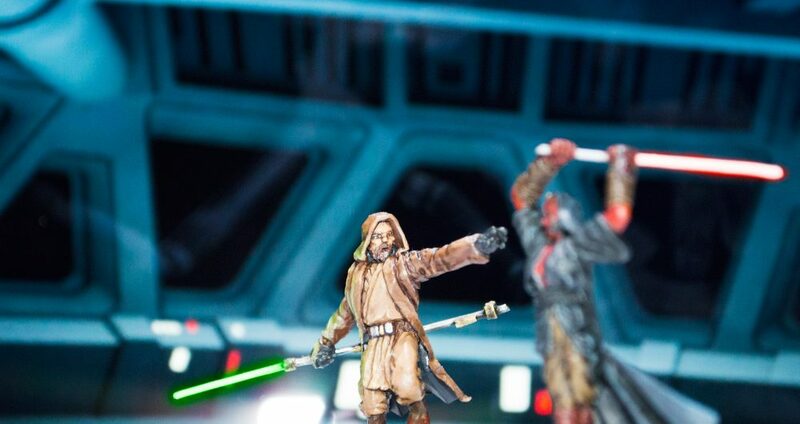 This miniature is fairly simplistic in appearance with few accessories or weapons to sculpt, the light saber is very simple to sculpt at this scale not needing much detailing (not pictured). I finished off the face in this step, adding eyes, lips and the nose. I find a pin or needle is a useful tool when working with small delicate areas like the face. Once dry, I go back over the mini with a file and knife and do the final clean up then wash the mini in the sink carefully scrubbing off the dust, stray cat hairs and other crud. The robe is made of paper, I carefully burned the edges of the paper to make it look a little ragged at the bottom. 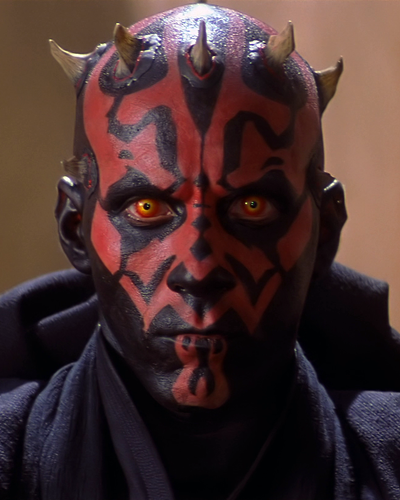 I decided to go with the classic red and black colouring of Darth Maul, its striking and imposing and red is always associated with the Sith in the Star Wars books, films and comics. I painted all the highlights on the face and chest in red then went back over it in black to do the tattoos. The boots and skin base tone are cavalry red. I simply applied thin washes of brown over the grey, this naturally added shades and highlights. The skin was a base of cavalry red with highlits working up through red to a 2:1 red yellow mix applied in very thinned down coats. The eyes are yellow. 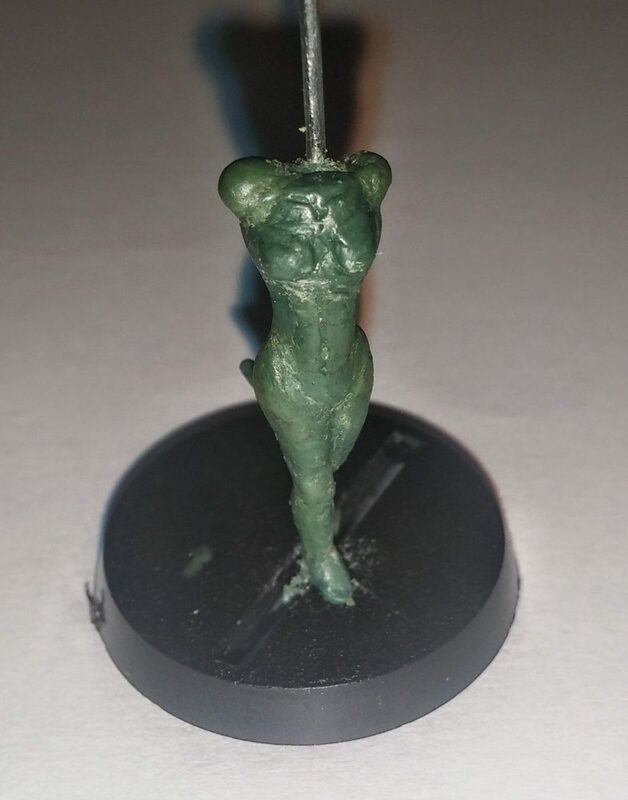 I am extremely happy with results, I struggled with the face, having to cut it off and start again several times during the sculpt, but outcome looks equal parts angry feminine and tough. If I could start again (and lets face it I could) id adjust the pose a little, pulling her left foot back a bit so it looks like she is stepping into her blow rather than twisting on it and to have the cloak flow the other direction to emphasize motion of the character. However these are minor points and she certainly doesn’t look out-of-place next to her Jedi Knight counterpart. Don’t forget to check out my other Green Stuff tutorials and Star Wars related posts.